Our passion and commitment is to educate you on your options, enlighten you to the possible outcomes, and empower you to make decisions that are in line with your goals. The first step in knowing where you are going is knowing where you are. We help clients evaluate what they currently have and how to make necessary enhancements. Functioning as a personal CFO, we work alongside our clients to help them make smart decisions about their money. Often people cannot see the forest for the trees. Our disciplined approach helps our clients overcome this obstacle. We are a team of experienced professionals with a variety of financial backgrounds. We offer comprehensive wealth management services that address a variety of financial concerns. Simply put: we care about our clients. We want to make a difference in their lives by offering ongoing guidance. We are uniquely positioned to look at both the qualitative and quantitative aspects of our clients’ lives. At Vision Capital Partners, we have decades of combined experience helping clients take a comprehensive and holistic approach to their financial situation. 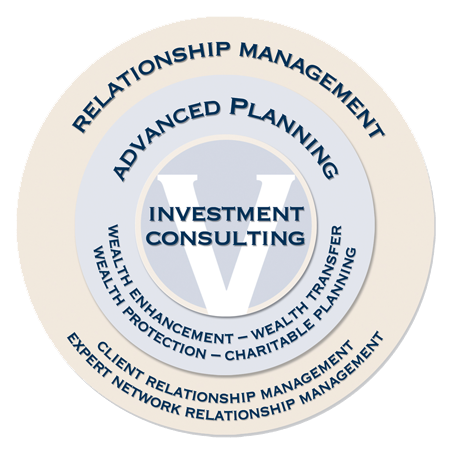 Investment Consulting is at the core of what we do. Our disciplined investment philosophy is based on years of independent academic research and serves as the foundation for more complex planning strategies. The four components of Advanced Planning address methods for enhancing, preserving and ultimately transferring your wealth. As your personal CFO, we coordinate efforts with your other advisors to form a collaborative team providing you with confidence and peace of mind. Securities offered through Triad Advisors, LLC., a registered Broker / Dealer. Member FINRA/SIPC. Investment advisory services offered through Vision Capital Partners, Inc., a Registered Investment Advisor. Triad Advisors, LLC. and Vision Capital Parters, Inc. are not affiliated.